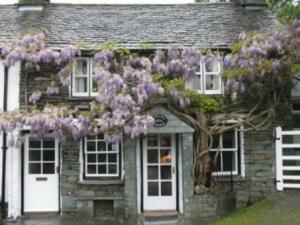 Wistaria Cottage & No.3 Main Street01782 783170work01782 783170fax Self-cateringWe have two lovely cottages win the village of Elterwater in the Langdale Valley, which we have owned since the early eighties. They were originally workers cottages from the Gunpowder Factor which closed down in the 1920's. As far as possible we have kept the original features: the open fires are made of slate from the local quarry: original beams: original doors with the "sneck" fastners on, and in the No.3 the original cupboards. Obviously we have had to modernised with fridge/freezers in the kitchen; freesat television with DVD and radio in the lounge; Wi-Fi and off peak heating. Wistaria Cottage is a traditional slate cottage, lies close o the village green but is set back from the road wit extensive views of the wooded fells and with parking space for one vehicle. No.3 Main Street is one of a row of traditional slate cottages. To the rear is a small south-east facing slate terrace with extensive views of Loughrigg Fell and Red Bank, an ideal place to relax. Car parking is by permit which is provided. Front of the cottage looking down the road towards Loughrigg Fell. Wistaria Cottage & No.3 Main Street offers weekly bookings starting on Saturday. Cottage sleeps 3. 1 twin bedroom and 1 single. No 3 Main St offers weekly bookings starting on Saturday. 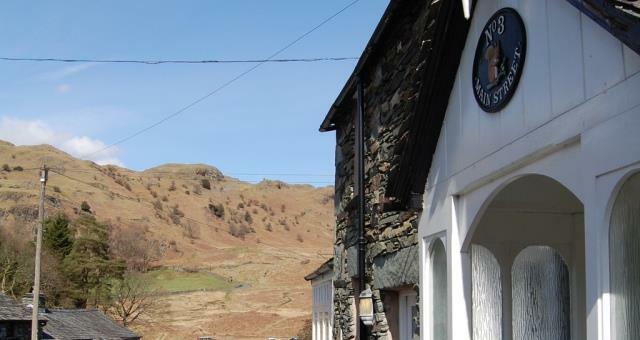 We have two lovely cottages win the village of Elterwater in the Langdale Valley, which we have owned since the early eighties. We service and maintain the cottages ourselves and travel to the village for this and meet our visitors. Langdale leisure club in village. Freesat Television and DVD (not Video player) available. Children welcome through prior arrangement, please contact for more information. Children welcome from age 2. Leave the M6 at jct 36 to The Lakes. Follow A590/A591 past Windermere to Ambleside. Go left at traffic lights sign posted Langdale - left on A593 - follow signs to Elterwater. By rail to Windermere then bus to Ambleside and then a bus to Elterwater.